Bangladesh - IOM General William Lacy Swing has welcomed the outcome of the 9th Global Forum on Migration and Development (GFMD). The three-day meeting in Dhaka, Bangladesh, which ended yesterday (12/12), focused on the upcoming Global Compact for Safe, Orderly and Regular Migration, scheduled to be finalized in 2018. “The timing of this meeting – right after the September 19 UN Summit in New York on large scale movements of refugees and migrants – was excellent. It was very good preparation and a good introduction as we move forward towards the Global Compact,” he said. Director General Swing spoke at the opening session, together with Sheikh Hasina, Prime Minister of the People’s Republic of Bangladesh; Lakshmi Puri, Deputy Executive Director, UN Women, representing the Chair of the Global Migration Group (GMG); Guy Ryder, Director General, International Labour Organization (ILO) and Wu Hongbo, Under Secretary General, UN Department of Economic and Social Affairs, representing the UN Secretary General. The Dhaka meeting brought together policy makers, UN agencies and civil society to discuss cooperation in global, social and labour market governance and issues such as gender, ethical recruitment, reducing migration costs, diversity and protection of migrants. Gervais Appave, Senior Adviser to the GFMD 2016 Chair and Senior Advisor to IOM DG Swing moderated the Common Space on the opening day of the Dhaka meeting, which focused on the Global Compact for Safe, Orderly and Regular Migration. DG Swing took part in a panel addressing Migrants in Countries in Crisis (MICIC). DHAKA: Sharing early implementation stories, the participants at Sunday’s Migrants in Countries in Crisis (MICIC) Initiative event showed how practical applications of the MICIC Guidelines are already leading to better preparedness in countries with an important migrant presence. “Migrants are generally invisible in crises. The MICIC Initiative Guidelines are an important step forward for the international community to better assist migrants who have ended up in a crisis situation,” said IOM Director General William Lacy Swing during the event. “The Initiative is a great example of how a committed group of States can work together with a broad range of partners to build consensus and make progress on an issue of global concern,” he added. The MICIC initiative was first launched in 2014 to help governments better respond to the needs of migrants affected by natural or manmade crisis. Two years later, in June this year, the initiative launched the “Guidelines to Protect Migrants in Countries Experiencing Conflict or Natural Disaster”. Sunday’s MICIC side event at the 9th Global Forum for Migration and Development in Dhaka was the first glance at the practical implementation of the Guidelines as experienced by the panelists. The implementation examples included training materials for officials in the front line of disaster response of both countries of origin and destination, developed through IOM’s capacity building program funded by the Government of the United States. Tools developed and piloted through this program include a Travel Advice Smartphone App to communicate more effectively with migrants in emergencies, an e-learning platform for consular staff to strengthen their emergency management capacity, and a training course for actors in host countries on integrating migrants in their emergency preparedness, response and recovery work. “It is very important to strengthen the capacity for peer to peer exchange between consular staff, as the first responders in any crisis,” said panellist Malin Frankenhaeuser, presenting the capacity building program led by ICMPD in support of the implementation of the Guidelines. Many of the event participants felt that the MICIC Guidelines are a good base to the broader discussion just starting around the Global Compact on Migrants and Refugees. It was stated that continuing the discussion both at the Global Compact but also during many Regional Consultative Processes would allow the participating governments to look deeper into how the Guidelines can help address the vulnerability of migrants more broadly. The inclusive process led by the MICIC Initiative consulting extensively with all key stakeholders —States, international organizations, private sector actors, civil society, including migrants and diaspora – ensured broad appreciation and support for the Guidelines among relevant stakeholders as highlighted by Mpilo Shange-Buthane representing Amnesty International. William Lacy Swing, IOM Director General, IOM; Rico Fos, Minister, Permanent Mission of the Philippines to the UN in Geneva; Jessica Yutacom, Programs Team Leader, Bureau of Population, Refugees and Migration, USA; Malin Frankenhaeuser, Program Manager for Migration and Development, ICMPD; Mpilo Shange-Buthane, Executive Director, Amnesty International, South Africa. The event was moderated by Michele Klein Solomon, Senior Policy Adviser to the IOM Director General. 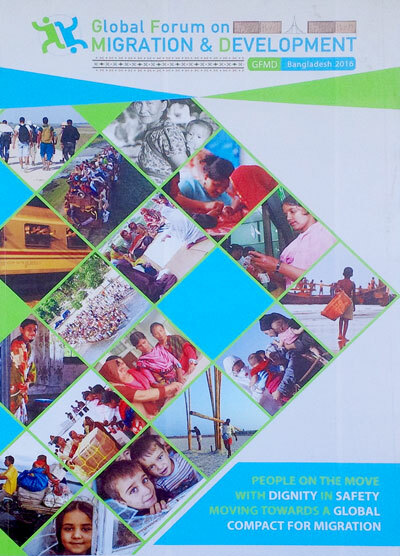 In 2014 at the GFMD in Stockholm, the Governments of the Philippines and the United States launched a State-led initiative to address the impact of crises – conflicts and natural disasters – on migrants. The co-chairs were joined by a working group comprising the governments of Australia, Bangladesh, Costa Rica, and Ethiopia; the European Commission; the International Organization for Migration (IOM); the United Nations High Commissioner for Refugees (UNHCR); the Office of the UN Special Representative of the Secretary General for International Migration; the International Centre for Migration Policy Development (ICMPD); and the Georgetown University Institute for the Study of International Migration (ISIM). IOM serves as the Secretariat for the MICIC initiative. The meeting also included a soft launch of the UN’s TOGETHER initiative, which aims to change negative perceptions and attitudes towards refugees and migrants, and to strengthen the social contract between host countries and communities, and refugees and migrants. The meeting also included an all-day film festival in Dhaka. The GFMD is a voluntary, informal, non-binding and government-led process open to all UN member states and observers to advance understanding and cooperation on the mutually reinforcing relationship between migration and development and to foster practical and action-oriented outcomes. The idea of creating a global consultative forum on Migration and Development was proposed at the High-Level Dialogue on International Migration and Development in 2006 at the UN General Assembly. The GFMD has met annually since its creation. GFMD 2016 was chaired by Bangladesh. GFMD 2017 will be chaired by Germany.